​The United Church of Canada sponsored Armenian refugees, most famously the Georgetown Boys, following persecution and genocide in Europe near the end of the First World War. In his paper, "The Cry of the Children: Accounting for the Entry of Child Survivors of the Armenian Genocide into Canada, 1880-1930" Daniel Ohanian examines the crucial role of campaigns on behalf of organizations like the Armenian Relief Association of Canada (ARAC) and the United Church of Canada. His work is a major research paper on Canadian immigration and church history in which religious, secular, and political interests intersect to engage individuals. 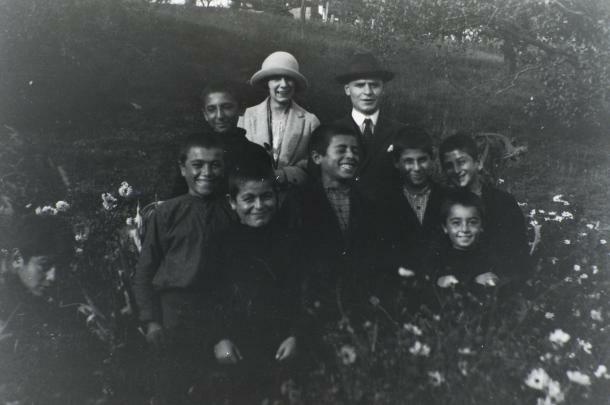 It led government officials to break with established immigration policy to relocate child survivors of the Armenian Genocide to Canada. "I conclude that it was due to the strength of popular support raised, made possible by the wider contexts within which campaigns were run as well as the strategies of representation they employed, that led federal authorities to break with their restrictive immigration policy,” he writes. The bulk of the photographs of the so-called Georgetown Boys are individual pictures of the boys, taken outdoors, in varying seasons, often with their arms crossed, and with large smiles on their faces. While the images conjure positive emotions, it is unclear from the pictures themselves what the full experiences were of these individuals once they arrived in Canada. Were they all put into happy, supportive environments? Did they receive the care necessary to mange the trauma they might have experienced before coming to Canada, and presumably were still having to deal with? Were some abused, exploited as farm labour? While most Canadians likely were sympathetic, did they face discrimination, did "Georgetown Boys" or "Armenian" take on a negative connotation in some circles? Finally, the photograph of "thanks" above: while it is often a sentiment that newcomers to Canada, particularly those who have struggled and lived through great hardships before coming to this country, such images have had the unintended effect of creating expectations of gratitude on the part of all newcomers; precluding newcomers from being able to be critical or make claims to rights and privileges. And opens to questions of when is a newcomer no longer a newcomer, when is a refugee no longer a refugee?